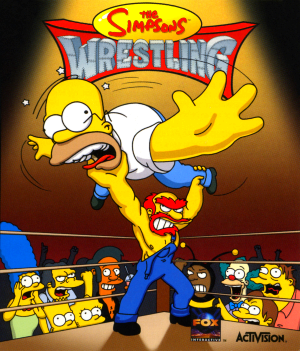 The Simpsons Wrestling is a professional wrestling video game, made for the PlayStation console. The game was developed by Big Ape Productions, and published by Fox Interactive and Activision. It was released in the PAL region on March 22, 2001, and in North America on April 12, 2001. Although no plot is given within the game, the manual provides an outline. An alien force (most likely Kang and Kodos) has challenged the people of Springfield to a wrestling tournament. Each character executes their own exclusive moves and gestures. The X button allows the player to jump to perform aerial attacks on their opponent. The ☐ button does basic melee attacks. The △ button makes the character throw a projectile at the opponent. The O button produces a special attack which is unique to the character and can only be used at certain intervals. L1 will make the character grab onto their opponent so they can be hit more easily. Characters can run towards the rope and bounce off to perform an attack. To win a round the opponent must be pinned down until the character counts to three. In the ring there are items that can be picked up. The most common item is a "letter" which will spell out TAUNT once five are collected. This will allow the character to turn invincible for a short while. Letters can also be collected by performing a combo on the opponent. Other items are donuts for an energy boost, atoms for full energy, popcorn for a health boost, Krusty-Os for a large health boost, sneakers for a temporary speed boost and a question mark for a random item. 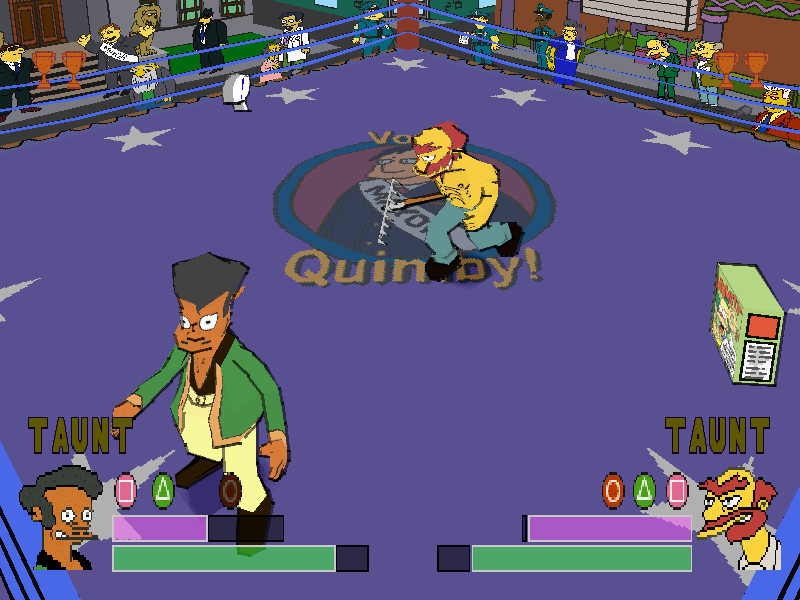 There are 18 characters in the game, all of whom are voiced by the same actors that provide their voices in The Simpsons. Bonus Matchup - An optional stage where you can play any character in any arena including bosses and Itchy and Scratchy. It can also be two player. Practice Game - A single match against a random opponent. Vs Match Game - A two player tournament. The game received mostly negative reviews from critics; it received an aggregated score of 32% on Metacritic. They criticized the game for having simplistic, unbalanced gameplay and bad graphics, but praised the game's audio track. 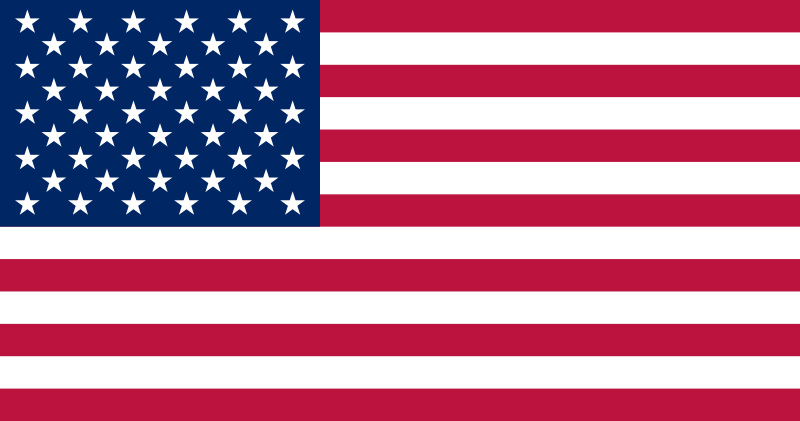 Modified on June 24, 2014, at 10:59.